Maintaining good water quality is essential for healthy koi, and your choice of pond filter can make or break this process. In this article we’ve researched the best koi filters currently on the market, with main considerations towards water filtration quality, cycling capacity, and ease of maintenance. Filtering a Koi Pond – What should you expect from a filter? Maintaining good water quality is vital for healthy koi, and your filter system will be at the heart of the process. Water filtration is one of the most important aspects of healthy fish keeping, providing a means to remove harmful substances and improve overall water quality. If you have koi in your pond, water filtration is even more vital, as koi are very sensitive to changes in water condition and can quickly become stressed or sick as water quality deteriorates. Keeping water quality stable and within safe parameters is one of our main goals as koi keepers! At the heart of this process is the pond filtration system, being tasked with the job of maintaining water quality by cycling water through multiple layers of media. While pond water is being cycled through a filter is will pass through 2 types of primary media, both biological and mechanical varieties. Biological media comes in all shapes and sizes, but the most important feature is a large surface area index for beneficial bacteria to colonize. The media itself cannot reduce harmful substances on it’s own, and requires bacteria populations get to work filtering out ammonia and nitrites as water passes through the filter. The larger the surface area of your bio-media, the more bio-filtration can take place. Alongside this you’ll want a few layers of mechanical media for removing larger debris and algae, which should be ideally layered from fine to course porosity. Having multiple layers of mechanical media ensures all sizes of debris are caught during filtration, as well helping lower the amount of cleaning required as debris is spread over a wider surface. Top pond filters will always have both types of media present, with the best ones being highly optimized for maximum bacteria colonization and debris removal. Beneficial bacteria needs a large surface area to colonize, as well as good water flow for oxygen so they can process harmful substances. You should look for a filter that comes with highly optimized biological media and provides good water movement throughout the system for best results. Some filters provide a better job of filtering out debris in comparison to others, and even though biological filtration is arguably more important, you still want to look for a good mechanical media system. This usually means a multi-step filtration process over a few different layers of media for catching debris of various shapes and sizes. Good water quality and clarity will come naturally as a product of proper water filtration, but you’ll want a filter that can help maintain good quality throughout the year. This includes a filter that is easy to clean manually, easy to maintain, and provides good water flow through each filtration step for better self-cleaning of media. Pressurized or Non-pressurized Filters – What is Better for Koi? Pressurized filters are a popular choice in many pond builds, as the pressurized nature allows installation at or below ground level, providing more flexibility when designing your water garden. Water which flows through a pressurized filter will be much slower in comparison to a regular filter, and this can be both a positive and negative aspect for koi ponds. The benefit of the slower water movement means the filter media has more time to process water, with mechanical media collecting more debris and bio media removing harmful substances. The drawback of this slower flow rate is although it is often better for mechanical filtration, it biological beneficial bacteria can suffer under the slower moving conditions. This is because beneficial bacteria are aerobic in nature, meaning they need large amounts of dissolved oxygen to process waste. Water which moves slowly will carry less oxygen content, and depending on your ponds bio-load, could mean you’re not getting sufficient biological filtration. This is usually only a drawback in heavy stocked koi ponds, and water quality should not be affected in ponds with a small number of fish. With that said, if you have a heavy stocked koi pond and want maximum water quality you may need to take extra steps to optimize the filtration process. These include adding a pre-filter, supplementing with more bacteria, or adding activated carbon to the mix. The benefits of these type of filters is they can process A LOT of water and will provide very good mechanical filtration for the largest of koi ponds. Non-pressurized filters are another option, being able to provide both good biological and mechanical filtration with little loss in water pressure. Although you’re more limited in terms of installation, quality box filters do not suffer from the same filtration issues as many pressurized ones. Water flow from your pond pump is not reduced when entering a box filter, so beneficial bacteria living on your bio-media will have much more oxygen content to help them process waste. The increased movement within the filter box also helps clean bio-media naturally, as the rapid flow literally knocks dead bacteria off so healthy bacteria can continue to colonize. In terms of mechanical filtration, top non-pressurized models should provide a similar level of debris removal as more expensive bead filters. They often have multiple layers of mechanical media with different porosity for maximum debris collection, and some even have extra tech features for debris/algae removal. Although they may not be able to filter debris as quickly as a pressurized model, the benefit is they provide fantastic biological filtration which is even more important to heavy stocked ponds. If you want the best of both worlds and the maximum amount of water filtration, a non-pressurized box filter can be added as a “pre-filter” system before a pressurized bead filter – thus providing extra bio-filtration before the mechanical filtration takes place in the pressurized unit. This may be overkill for lighter stocked koi ponds, but may be an interesting option for pond owners who just want the best for their koi carp. Should you add a “Pre-filter” for the Best Water Filtration? If you suffer with a lot of debris and have a heavy stocked pond, installing a pre-filter may be beneficial. As touched upon above, in some cases you may have benefits from pre-filtering water before it hits your main filtration system. This is more common is very heavily stocked koi ponds, but can work in smaller stocks ponds if you want the best in terms of water quality. Pre-filtering works by installing a second filter device before your main filter box. This could be anything that collects extra debris or provides extra bio-filtration, such as skimmers, leaf baskets, or even a second filter box. Whether you need to pre-filter would depend on your stock levels and filter choice, as a quality non-pressurized box filter should be able to provide efficient bio and mechanical filtration for most sizes of koi ponds. If you suffer with a lot of debris, however, and have a very heavily stocked koi pond, then installing both a bead filter and a box filter may provide the best filtration results. If you do choose to pre-filter with two filter boxes, you will need to make sure your pond pump is strong enough to move water efficiently between the two filter systems. Since one filter will likely be providing the main mechanical filtration, some mechanical media can be removed from the bio-filter and replaced with extra biological media for better bacteria colonization. This will also help maintain better water pressure before the water hits your main filter system. Along with adding a pre-filter, both activated carbon and bacteria supplements can be used to maximum water quality and encourage bacteria growth. Testing your pond water monthly after installing a new filter will help you determine if your filtration system is up to the job. If you’re seeing only slight rises in ammonia and nitrites, you may just need to provide extra beneficial bacteria to keep this down. Likewise, adding activated carbon every few months to the filter box will help neutralize organic pollutants that bio-media can’t remove. Things like chlorine, perfumes, medicine, pesticides, fertilizers, and even smelly odours can all be reduced by using activated carbon. If your water quality tests are still coming back with rising ammonia, and your pond is fairly clean, then adding a pre-filter device (or second filter) may be the best choice. However, in most cases, simply choosing a top quality main filter and supplementing with bacteria and activated carbon is all that’s needed to keep a pond in balance. Q) What is the best koi filter system set up? The best filter set-up would depend on your pond size, stock levels, and the amount of bio-load your have in your pond. This would depend on your pond size and koi stock levels, but a safe choice to start would be a quality non-pressurized filter combined with a reliable koi pump. Non-pressurized box filters won’t reduce water pressure, and also provide good all-round biological and mechanical filtration. If you’re unsure how much filtration your pond will need, we recommend testing water quality for a few months after installing your filter. If you’re still having problems with debris and poor water quality, switching your non-pressurized filter to a pre-filter and adding a second bead filter for mechanical filtration may be the best set-up. A typical arrangement in this regard would be: Intake -> Pond Pump -> Pre-Filter -> Main Filter -> Out-take (into pond). Q) What size of pump do I need with my koi filter? If you have koi in your pond you’ll want to make sure all pond water is cycled through your filtration system every hour for the best water quality. For example, if you have a 5,000 gallon koi pond you’ll want a pump that can provide 5,000 gallons per hour (GPH) of flow rate. Non-pressurized filters will have minimal effect on water pressure, but if you have a pressurized filter you’ll need to take into account the reduction in flow rate as water enters the system. You can easily blow a pressurized filter if your pump is too strong, so you’ll want to double check a filter’s requirements before investing further. For more information on the top koi pumps, check our main article on this here. Q) How often should I clean my filtration system? Whatever your filter set-up, it will eventually need some TLC to maintain good efficiency. Top-end bead filters will usually have an automatic “blower” system built into the design, which provides easy discharge and shake up of the internal media. This can be carried out regularly to prevent clogging and is usually as simple as turning a valve and aiming your discharge hose! In terms of non-pressurized box filters, you’ll have to keep an eye on the water flow coming from the filter out-take into the pond. A good indicator of when to clean is when you notice pressure loss and slower water movement, which usually indicates clogged media in the filter. This needs to be cleaned asap, as the longer the mechanical media is clogged the higher the risk of beneficial bacteria death on the bio-media. This happens when water flow is reduced, leading to less oxygen in the filter, causing aerobic bacteria to die and anaerobic bacteria to rise. The first bacteria you want, the second you definitely don’t, as they produce smelly hydrogen sulphide as a by-product of decomposition – the smell of rotten eggs! For our full guide on cleaning and optimizing your filter box media, be sure to read through our main cleaning media article here. Below are some of our top koi filter recommendations, all of which have been chosen based on their biological filtration efficiency, mechanical filtration efficiency, and ease of maintenance. There are options for non-pressurized box filters as well as top-end bead filters for massive mechanical filtration. One of our favourite pond filters from our main filter review article is the Oase BioSmart filtration system. These non-pressurized box filters have been specifically designed with fish keeping in mind, having some of the best mechanical and biological filtration we’ve seen in a low-cost koi filter. The filtration system features multiple layers of mechanical media with different sizes of porosity, which helps catch all sizes of debris. This layered media has been dual-optimized for bacteria colonization, so also acts as the filters main source of biological filtration. Although it’s unusual to see this type of design, the media is very high quality and appears well optimized for large amounts of bacteria to easily grow. The filters also have a high flow rate throughout, so low oxygen levels won’t be a problem for bacteria growth. Cleaning is incredibly easy thanks to a clever system which allows you to clean without physically removing media. A handy light indicator will flash when media becomes clogged, and then you just need to open the top of the box and manually lift the cleaning pads contained within each media form. Performing this several times removes debris from the foam, which then sinks to the bottom and is discharge through a waste outlet. As well as this, the filters have a built-in temperature gauge which can be useful for winter months when you’re close to freezing point, and also have a sludge drainage valve to quickly get rid of bottom muck that builds under the pads. They also have a built-in 24 watt UV clarifier for free-swimming algae control as standard, which will also help remove harmful bacteria which can cause issues with weak and young koi. The “flow through” design of these filters means you’ll get good water flow and little loss of pressure which helps with biological filtration, and we highly recommend them for ponds between 2,000-8,000 gallons. For the asking price, and taking into account how good the filtration is as standard, you really can’t go wrong with this filter for low-medium stocked koi ponds! The more high-tech version of the Oase BioSmart is Oase’s newer BioTec filtration range. These fancy filtration systems provide some of the best biological and mechanical filtration for koi ponds on the market, and their unique “screening” feature hugely reduces clogging and overall maintenance. Water entering the intake of the filter goes through an initial screening process before it can enter the main chamber with biological filter media. Debris collected during the screening process is automatically deposited in a separate holding tray via a rotating conveyor belt on a 30 minute process loop. This high-tech feature may seem like a novelty at first glance, but it actually provides really efficient mechanical filtration and prevents debris from entering your bio chamber which can clog bacteria and lower oxygen content. The screening system has a good width and would work great for all sizes of ponds, depositing debris every 30 minutes and letting your beneficial bacteria work uninterrupted. Underneath the screening tray there are multiple layers of different bio-media which have been optimized for high surface area indexes. The flow rate is great throughout, so beneficial bacteria should ave plenty of oxygen internally to work efficiently breaking down koi waste substances. At the very bottom of the box are multiple pilers of zeolite, which works in a similar way to activated carbon, neutralizing organic pollutants which bio-media cannot remove. 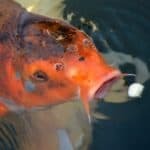 This is a great extra feature for koi ponds, as carp can be extra sensitive to rises in pollutants such as chlorine, pesticides, and medicine residue. The zeolite will also be able to reduce excess nutrients, such as phosphates, which should help control algae growth in Spring and Summer. A UV clarifier can be added separately for further algae removal, and cleaning is carried out by manually pressing the media foam so the debris sinks to the bottom and can be discharged via the sludge drain. This means you never have to take the filter apart, and just need to empty the screening tray and press the bio-foams manually when necessary. The filter comes in a few sizes, and there is even a flow adjuster switch to help match your pump’s flow rate strength. We wouldn’t recommend this filter as a pre-filter due to the screening feature , although you could certainly run it on a separate circuit alongside a pressurized unit for some crazy good filtration. With that said, for most sizes of koi ponds you can easily run this as a single filtration system and achieve very good water quality with it’s great mechanical and bio filtration. It’s a little on the expensive side, but for the price you get some really innovative features and some of the best water filtration we’ve seen. The best pressurised bead filter for heavy stocked koi ponds, providing great mechanical and biological filtration. Unlike classic bead filters, this particularly brand isn’t a true “bead” filter as it utilizes a hollow media of various sizes to prevent clumping, whereas a regular bead filter uses a universal sized media type. We like this unique media as we feel it is far better for bacteria colonization, with it also helping to keep bacteria healthy by preventing build-up of debris on the media’s surface. The main issues with pressurized filters in terms of biological filtration are two-fold – 1) oxygen content is lower in slowing moving environments, and 2) beneficial bacteria will be discharged when using a classic “blower” back flush system. The Ultima II tries to get around these issues by changing the way pressurized filters regulate water and self-clean. For example, this range of bead filters doesn’t have a blower function, and instead it uses a “blast” system which lifts and spins the media, effectively separating the debris for easier removal through a waste line. This system should keep most bacteria colonies in tact, maintaining higher quality bio-filtration during and after cleaning. As well as this, the range has been designed for the highest flow rate possible, and even though the filters are pressurized, water movement is certainly better than most other bead filters. This feature coupled with the unique method of cleaning means you’ll have far better biological filtration if you wanted to use it as a primary filter system. In terms of mechanical filtration, the Ultima II is excellent, and you’ll be hard pressed to find a pressurized filter that offers the same level of debris removal. It would be even more impressive if combined with a pre-filter, which would also give you the maximum water quality possible from water filtration. Although pricey, these types of filters are designed for heavy stocked koi ponds and owners who need the best filtration possible. They also offer more installation flexibility as the pressurized environment allows them to be installed above or below ground level. You’ll need quite a lot of head height from your pump to keep sufficient flow (around 8ft of head), however, so you’ll want to make sure your pump is strong enough to match the filters requirements. Overall, a fantastic bead-style filter with highly optimized bio-media and a great cleaning system for easy maintenance. Can be combined with a pre-filter or used as standalone filtration system in both small, large, and heavy stocked koi ponds. What kind of sludge problems are you experiencing? Do you mean bottom sludge on on the pond floor, or are you getting sludge build-up within the filter itself? Can I use a submersible pump rated for 1200 gph for the AquaUltraviolet Ultima II Bead Filter, or do I need to use the pool type of pump designed for koi pond, which is not submersible? A submersible pump would work fine so long as the pumps GPH rating matches the filters minimum flow-through rate and the pump has adequate head to actually move water up to the filter box. For the Ultima II 8 feet head height requirement, is that dependent on where the filter is place relative to the pond? Can I place the filter 1 feet above the surface of the pond (2 feet deep)? If so, would I still need a pump that supports 8ft of head height? Your head height potential will be determined by the pump and the total distance the pump needs to move water to the necessary equipment (and to a lesser extent hose/fittings). Filters like the Ultima range will always require more head due to their pressurized nature and how water moves through the system. The recommendation you’re seeing for 8′ of head height is assuming no extra height in the system, and acts as a minimum base value. If we assume no extra height (not really possible! ), the pump basically needs to provide the recommended flow-through rate (can view this on their website) while operating at 8′ of height for the filter to function optimally. Most pumps will show their head height values at different heights in their specification sheet, but you can also contact manufacturers to make sure. In your situation, and depending on how deep you place the pump, you’d need to take into account a potential 1-3 foot of extra height. Therefore, ideally, you’d be looking for a pump that produces the minimum flow-through rate the filter requires at a total of between 9-11 foot of head height.